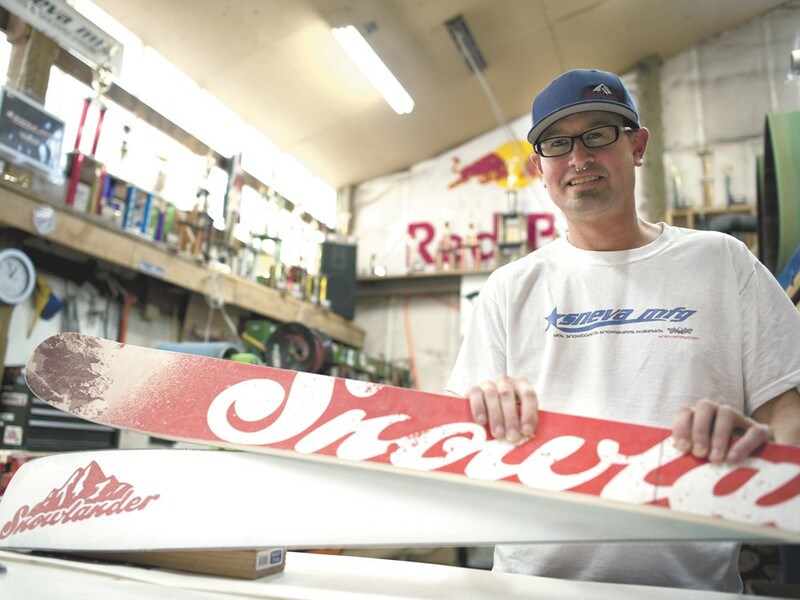 TJ Sneva with a pair of custom skis he was hired to build for Snowlander. Dozens and dozens of shiny trophies line a high shelf going down the long wall of TJ Sneva’s north Spokane workshop. A fine layer of sawdust covers almost every surface and the air is permanently tainted with the light, crisp scent of fresh-cut wood. A rack hanging on the wall opposite the trophies holds several pairs of colorful skis. At first glance, one might assume the chintzy plated trophies are the result of the speed, talent and agility of the skis’ rider. But they’re not. For nearly two decades — and for the past four years in Spokane — Sneva has been building wooden cored, twin tip alpine skis in a backyard shop for his custom ski and snowboard business, Sneva Mfg. Indeed, Sneva is an avid and skilled skier, but the trophies that shine in the light through a fine layer of sawdust were all earned during his decade-long stint as an Indy racecar driver. Going fast is in his blood. Sneva grew up around racing and skiing. His uncle Tom Sneva won the Indianapolis 500 in 1983, and his father, Jerry Sneva, also raced there for five years. A Spokane native, Sneva learned how to ski on the bunny hill at 49 Degrees North when he was just a toddler. As he got older he became hooked on the sport; a family pastime he remembers well, if mostly for the hand-me-down skis he rode that had been his grandpa’s in the 1960s. After high school, Sneva went on to work as a Sno-Cat operator at Oregon’s Mt. Hood Skibowl where he also started building skis. And these weren’t just any skis, Sneva says, but the first twin tip alpine skis, meaning the front and back end of the skis are curved up so riders can go forwards or backwards down a slope. He took the business with him to Indianapolis, contincheyuing to make skis through the racing stint, but says since moving back to the Inland Northwest the venture has started to really take off. Sneva guesses he’s made 5,000 or so pairs of skis since starting out, and in recent years has turned out about 300 pairs a year. On most days — unless a blanket of fresh powder coats the slopes — Sneva is the only one in the shop, working anywhere from 10 to 14 hours at a stretch. It’s a one-man operation, but occasionally friends help out. Of the 36 different models of skis he’s designed, Sneva will customize any pair — from the flex, width and length, to the top and bottom graphics — to fit an individual skier’s riding style. Most of the models are suitable to any style of skiing: powder, park, carving, big mountain and all mountain. “A lot of skis anymore are getting to where they’re condition-specific,” he says. “We try as much as possible to stay away from that so our skis can run in any condition well.” That said, Sneva Mfg. does offer several models designed for certain terrain and styles. Every ski Sneva makes utilizes a sandwich-style construction process. The wooden cores are made with strips of raw lumber, then sanded to a tapered shape with the thickest point in the middle of the ski. The fiberglass top and bottom layers are then coated with epoxy, and when the adhesive is still wet the pieces are placed into a hydraulic press which heats and dries the epoxy as massive force is applied to squeeze the layers together. After that, finishing processes include trimming off the excess material and sanding the fiberglass bottom. Right now, Sneva Mfg.’s skis are only available to order online at snevamfg.com, but later this year a few models will be stocked at The Shop sports store at the North Division Y. Skiers interested in demoing a pair can choose from 10 or so models at 49 Degrees North’s ski shop, Sneva adds.